After 6.5 years of ownership, it’s time to try something new. I have thoroughly enjoyed my time with this M3. The car drives flawlessly. No history of accidents, paint, or body damage. It recently had an extensive service done and passed with flying colors. Trying for a local sale before sending this to auction. Condition: I’d consider this vehicle in very very good condition. With some time and fine-toothed comb, this car could easily be brought to excellent show-car condition. 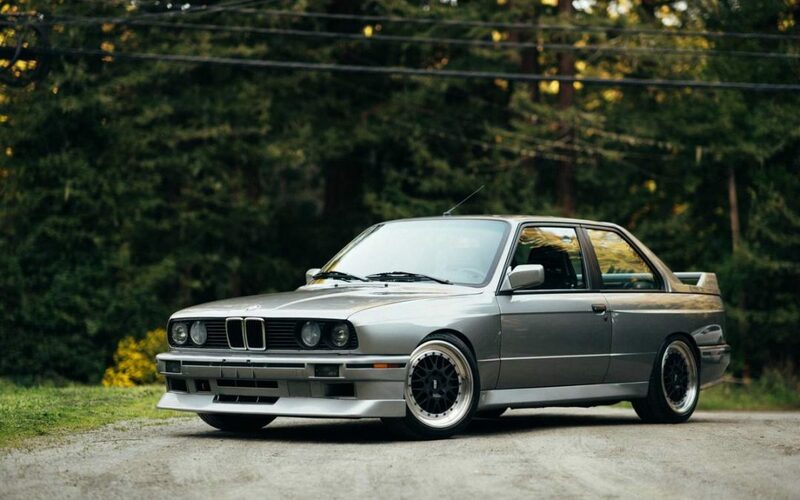 This car has always been maintained at high-end shops which specialize in E30 M3s for the past decade. During my ownership, I have tracked the car twice and the car has performed flawlessly. Really makes you feel like a DTM hero! I have all maintenance records during my 6.5 years of ownership and moderate records from before my ownership. – One of the fog-light lenses has a crack starting to form. Doesn’t impact functionality in any way. – Due to width of wheels, tires rub past 0.5 lock. One of the lips bent on a pot-hole back in 2013 or 2014. I purchased replacement cutter halves which ended up being a bit wider than the originals. I have 4 0.0″ BBS motorsport outer halves that will be included in the sale. One of them has a dent and doesn’t hold air. I would try to replace the damaged lip and aim to return the wheels to a narrower setup (currently 17x9″, originally 17x8.5” I believe). – Shifter linkage makes the typical vibration/buzzing noise in 4th or 5th gear. This is standard for the E30 M3 and requires changing out a bushing in the shift linkage. – 1st owner – 1989: This car started its life in Hawaii where it was owned by an investment banker on the Big Island. – 2nd owner – The car was maintained by a father & son BMW specialty shop. The shop bought the car from the original owner and the car served as the shop’s show car. At that time, the car was completely stock save for E39 M5 wheels. The car was then bought by an individual in Irvine/Newport Beach in early 2000s. – 3rd owner – This owner went through and performed all the extensive modifications you see today. He was of Yemeni descent and I was told he was deported in 2005/2006. The tow company that impounded his car ended up buying the car. They attempted to list it on eBay where it did not sell. The 4th owner was based in Orange County and completed the deal off-line. – 4th owner: Purchased the car from the towing company in July 2010 with 58k miles. The car had been sitting for some time and this owner brought the car back to life. Upon purchase, the car had a broken windshield, no rear wing, rims / tires that didn’t hold air, and the motor was in need of a valve adjustment and had a few vacuum leaks. Also $1,500 dollar registration hold due from parking and towing / storage fees. The car was brought back to life and maintained by Bullet Performance in Costa Mesa CA. – 5th owner: I bought the car in June of 2012 (What a day!). I had a PPI performed by Bullet Performance. Since then I have maintained the car and enjoyed it in it’s current state, making no major changes/enhancements other than replacing consumables as needed (e.g., brake pads, tires, etc.). Photos courtesy of Courtney Cutchen Photography (www.courtneycutchenphotography.com/). Happy to provide link with further photos to interested parties.